A few things I would like to say about the gym. I go to a tiny gym near my work. It has 3 treadmills, 2 elipticals, a ski machine (is that what they are called?! ), 2 bikes, and about 15 different weight machines. There’s a tiny weight section with 1-30kg dumbells (no bars for squats/dead lifts) and there is space for 2 people doing mat work max. It’s sucky, but it’s convenient and cheap. Today I did not have a good gym session. I went straight after my 9-5 at work today. Normally I like to go to the gym in the morning, and I did have to get up at 6:30am to take my brother to the station. Why didn’t I go before work, you ask. WELL, this personal trainer there keeps talking to me, which I find kind of annoying, because I’m in the gym trying to get in the zone and here he is bugging me. He also keeps trying to talk to me about philosophy (usually when I tell people that was my undergrad degree they look at me cluelessly but no, this guy LOVES philosophy. Yay.) which is a little intense when I’m trying to concentrate on my work out… This guy is late twenties and the other day he text his fellow personal trainer to get her to give me his number. just after he left the gym. Lame. Also I didn’t want his number. But she insisted I take it so she had ‘done her part’. Fair enough. I put it down somewhere when I got in and haven’t looked for it since. He tells me pretty much every time I see him that he’s in the gym most mornings. Now you see why I waited til after work, having not been since this number incident on Saturday. I really don’t like awkward situations. Alas, HE WAS THERE. Why, tiny gym! Why must you be so tiny. Thankfully he was obviously busy with some training so I kept my distance (as much as possible) and headphones in on loud. There I was minding my own business on the leg extension, I’m currently doing 5-10x 30 or 35 on that, so I was minding my own business, working really hard. Next thing I know there is a hand in my face waving. A very curt ‘hi’ was all I could manage without losing my temper. That is gym rant number one. Moral of the story – don’t get dragged into unwanted small talk! My second gym problem is also related to the teeny tiny size of this gym. Given it’s location, it’s hardly surprising, but I keep running into people from my old high school. People who I didn’t really like then, and would rather not be in a small confined space with whilst sweating like a pig now. Home town problems. This applies equally to seeing locals from the pub. It’s just a little odd. It’s not that I don’t like seeing people I know in the gym, on the contrary it’s one of the things I loved at my uni gym. It’s awkward. Ain’t nobody got time for that. Final gym issue today comes from the fact that I somehow forgot to take a water bottle. I am an idiot. There’s something about running on a treadmill that just makes you crave water much sooner/more often than when running out in the open. I suspect this is some kind of psychological thing, combined with the dryness of gym air as created by the air con. These are my issues from today alone. I could go on into a more general line of repeated issues, but I will leave that for another day. 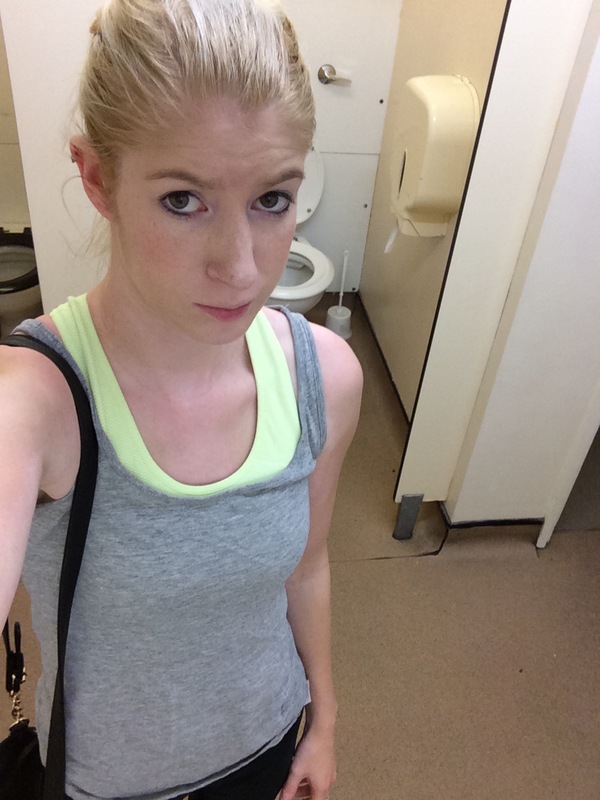 Grumpy gym toilet selfie sums up my mood for this post.